For the first time in its history, Tudor has created a unique reference, the Heritage Black Bay One for Only Watch 2015 modelled on the Submariner ref. 7923 of 1954, featuring a gilt dial and pencil hands. 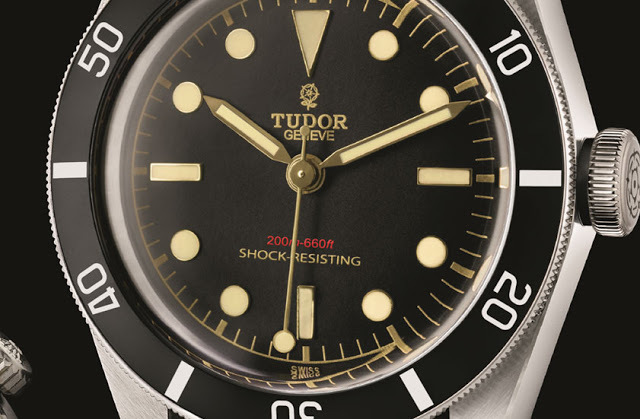 Tudor has never made limited or unique editions, at least none that are publicly known. 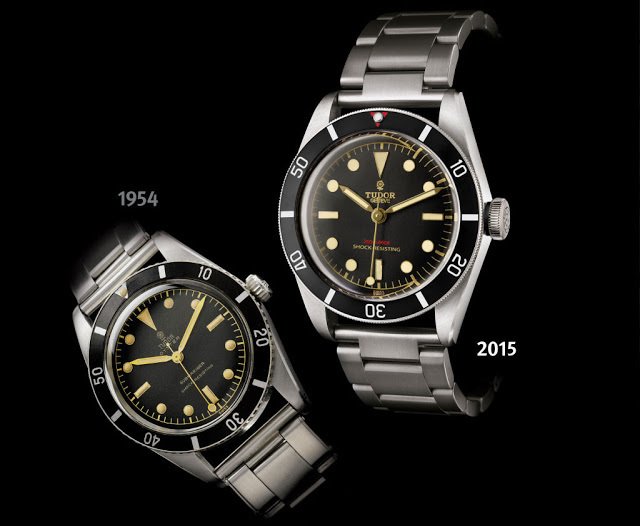 So the Heritage Black Bay One is a distinct departure from the norm. A one of a kind timepiece made for charity auction Only Watch, the Heritage Black Bay One is modelled on the regular production Black Bay, with a special dial and bezel inspired by the reference 7923 dive watch of 1954. With the unique model reference 7923/001, the Heritage Black Bay One sticks to the formula Tudor has applied for all its Heritage timepieces. 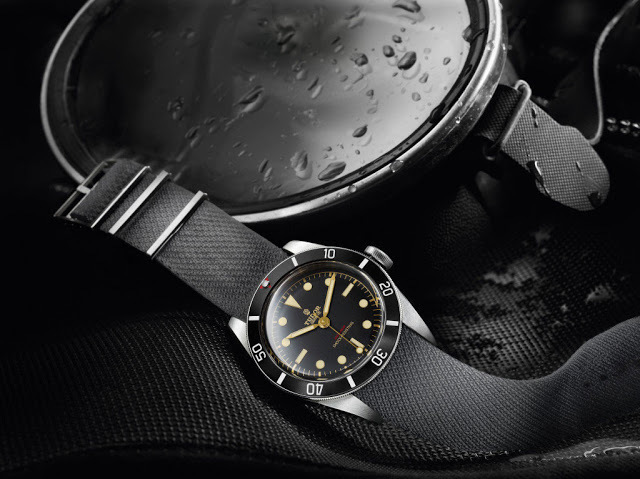 Not a literal remake of the original, the Black Bay One is heavily inspired by the 1954 model, but still different. 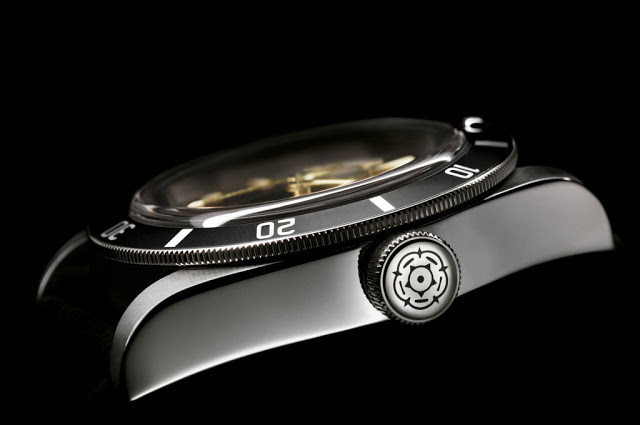 The bezel insert is black without minute markings, and a red triangle at 12 o’clock. And the dial is a wonderful pastiche of design elements from vintage Tudor and Rolex dive watches. It’s a glossy black gilt dial, with gold-tone markings and text. The hands are similarly gold-plated, as are the metal surrounds for the hour markers filled with luminous paint. A particularly vintage touch, though not one found on the original, is the “200m=660ft” at six o’clock. This recalls vintage Rolex dive watches in its colour, while the text itself is reminiscent of the desirable “meters first” Rolex Submariners (that were later superseded by the more common “feet first” models). Like the regular production Black Bay, the Only Watch edition has a 41mm steel case with a domed sapphire crystal and the ETA 2824 inside. Unlike the regular edition it’s fitted to a steel bracelet with retro-style straight ends that’s not offered with the regular Black Bay, though this bracelet is available on the Heritage Ranger. The Heritage Black Bay One will also be sold with an aged brown leather strap and a grey, jacquard-weave fabric NATO-style strap; multiple strap options packaged with the watch are standard for Tudor. Only Watch 2015, a biennial auction of one of a kind timepieces that raises money for research int Duchenne muscular dsytrophy, will take place in November 2015. Stayed tuned for more unique pieces that will be revealed in the coming months.